October is National Pit Bull Awareness month, so let’s talk about these dogs that I have come to adore. Pit Bull and Bully are generic terms used to describe dogs with similar characteristics such as blocky heads, short muzzles, large bones and heavily muscled bodies. This includes the American Pit Bull Terrier, Bull Terrier, American Staffordshire Terrier, American Bully, Staffordshire Bull Terrier, American Bulldog and several others. Pit Bulls are descendants of the English Bull Baiting Dog which were bred to bite and hold bulls, bears and other large animals around the face and head. After baiting animals was outlawed people began fighting dog against dog. The larger, but slower baiting dogs were crossed with smaller, more agile terriers who were far more athletic and therefore more desirable in the pits. Other desirable traits in these dogs were their intense loyalty, love and desire to please humans. Unfortunately, these traits were exploited by people wanting to make a few bucks and be entertained. Pit Bull type dogs have not been the only breed to be maligned. During the Civil War and aftermath, Bloodhounds were feared for their bloodlust and ability to scent bad guys. This may have been partly due to the way they were portrayed in “Uncle Tom’s Cabin”, and by the increasing popularity of newspapers. In the early days of sled dogs, Malamutes and The Siberian Husky were associated with wolves because of their similarity in appearance. These sled dogs were often starving, and when they weren’t pulling a sled they were often left to their own devices. They would hunt in packs and did unfortunately kill humans. (usually children) Of course, newspapers sensationalized these tragic events without considering the circumstances. During WWI, German Shepherds were the villian of choice but thankfully Rin Tin Tin saved them from being forever misunderstood, and in fact turned them in to heroes. During WWII Doberman Pinschers and Rottweilers became popular guard dogs and were thusly the new dogs to be feared and loathed. In the 1900’s the Pit Bull was the most popular dog in America. They were known as “nanny dogs” because they were so good with children. When dog fighting started to become more organized, people started using Pit Bull types because the bigger breeds like Rottweilers were harder to control for the handlers. Pit Bulls were the ideal size, usually ranging from 50-70lbs. Because of their intense love and loyalty , they were also the least likely to bite their handler. In 1987 Sports Illustrated had a Pit Bull type of dog on the cover with the headline “ Beware of this dog”. 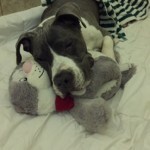 Pit Bulls were in the spotlight and they were portrayed as vicious killers. Anytime someone was attacked by a dog it was allegedly a Pit Bull. Suddenly Pit Bulls became the staus symbol for gangs and criminals who wanted a tough guy image. They went from being “nanny dog” to public enemy number one seemingly overnight, and have remained so for nearly three decades. Now let’s talk about the myths surrounding these dogs. I think the most popular one is that Pit Bulls have locking jaws. This is completely false. There are no dogs with locking jaws. If you were to compare the skull of a Pit Bull to the skull of a Chihuahua you would see that the bone structure is largely the same. There have also been stories of Pit Bulls exerting 1600 pounds of bite force per square inch (PSI). In fact, the highest PSI recorded from an American Pit Bull Terrier was 235 lbs. PSI. Rottweilers are 328 lbs PSI, and there are Mastiffs with 500 lbs of bite force PSI. Another myth is that Pit Bulls don’t feel pain. I assure you that they can and do feel pain. However, like many (humans included) in a fight or flight situation, they may go on fighting as if there is no pain both to survive and to please their handler. Still another myth is that a Pit Bull who is aggressive toward other animals will be aggressive with humans. Pit Bulls are one of the most loving, friendly, and loyal dogs out there. In fact when tested by the American Temperment Test Society American Pit Bull Terriers scored an 86.8% which was higher than the Golden Retriever who scored an 85.2%. Incidentally, I own a Golden Retriever. 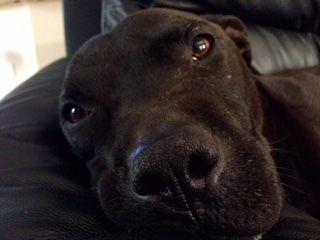 The idea of a red or blue nosed Pit Bull being a special type of Pit Bull, and therefore more valuable than a Pit Bull with a black nose is also false. It’s just pigment. We also have to talk about responsible ownership. Pit Bulls have been bred for hundreds of years to fight. Humans have created this. We have selected the desired traits and have continued to breed and train these dogs to fight. Now we want to blame the dog for it’s behavior? We cannot blame specialized breeds for doing what they were bred to do. A Border Collie who has never been on a ranch, or herded cattle may instinctively herd your human children. A Coonhound who has never been on a hunt may instinctively tree a racoon. German Shepherds are instinctively protective even though they may have never been formally trained as a guard dog. Or, none of these things may ever happen. My Golden Retriever does not retrieve, or swim. It’s about being aware people! Know the history behind your breed of choice. 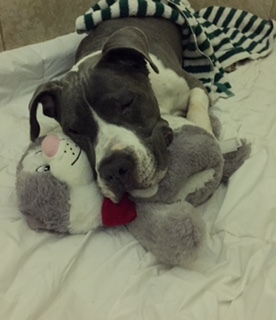 If you choose to adopt a Pit Bull type whose history is not known be vigilant until you know how they will react around other animals, people and in unfamiliar surroundings. I say this about Pit Bulls because it’s Pit Bull awareness month, but I would advise the same thing if you were adopting a Labrador Retriever. The point is, any breed can attack at any given time. Most higher risk Pit Bulls are owned by higher risk people. In other words, people who are involved in criminal activity, or who have no conscience. The FBI includes abuse of animals as part of its profiling of serial killers. Violence toward animals is linked to violence toward people. And let’s be clear. Training a dog to fight is abuse. I have worked with hundreds of Pit Bull types over the years. I have seen horrible things; dogs whose teeth had been filed down, dogs whose whole bodies were scarred from fighting. I have never been bitten by a Pit Bull. One thing always stands out, and that is their capacity to still trust and love humans no matter what abuse we throw their way. Out of the 49 surviving dogs from the Michael Vick case, 47 of those dogs were rehabilitated. Some went on to become therapy dogs, or ambassadors for the breed. A bunch went on to live with families who had children and other pets. The love that these dogs offer know no bounds. If you’re lucky enough to have one of these beautiful dogs in your life, be grateful. You’ve been blessed.